​When I Turned Nineteen: A Vietnam War Memoir is a true story that chronicles Haynie’s long journey as a nineteen-year-old who was sent by his country to fight an unpopular war. It is a moving memoir from the eyes of a young soldier, and it takes the reader through intense bursts of fear and the stresses of combat. It exudes how brotherhood bonds were made. Haynie writes with a heartfelt compassion as he chronicles his observations of war. Writing this book was the first time that he examined in detail his experiences with First Platoon in Vietnam. Over the past 47 years, he had never discussed it with his First Platoon brothers or even his best friend Mike Dankert, who was with him during it all. He didn't know which was more difficult, reliving the events of 1969 while writing the book or sharing his story. In 1969, Haynie served in the U.S. Army with the First Platoon Company A 3rd Battalion/1st Infantry Regiment 11th Brigade Americal (23rd Infantry) Division. They were average American sons, fathers, husbands, and brothers who enlisted or were drafted from all over the United States and came from various backgrounds. They came together and formed a brotherhood that will last forever. He shares his experiences about weeks of boredom and minutes to hours of terror, surviving the heat, carrying a 60-pound rucksack, monsoons, a forest fire, a typhoon, building a firebase, fear, death, and fighting the enemy—all while experiencing mental, physical and moral exhaustion. Haynie didn’t write much about the politics of war, but he did write about how war affects the humanity of soldiers ordered to war and what they have to live with when they come home; the lucky ones get to come home. Memoirs are usually not written by professional historians and their worth depends on effectively communicating experience. Haynie's account succeeds wonderfully, and his success is oddly due to a technique long used by professional historians: The use of (mostly) contemporary letters written by his comrades that are expertly placed around the events that he also experienced. Although the letters have likely been edited to exclude certain personal details, Haynie did not edit them to include only "action" accounts. In preserving comrades' routine of life, something else is communicated: The reality that a soldiers' life also includes army procedures, boredom, recovery from disease and wounds, and plain trivia. Using this technique essentially transforms Haynie's memoir from a strictly "as I saw it" account into a group memoir, with great added value for readers. Haynie's own prose is straightforward, unaffected and unembellished, which also adds to its veracity. As a professional historian, I enjoyed the book much and finished it knowing something more about both the Vietnam War and the subjective experience of those who fought it. I recommend this book without reservation. Personal and moving - A young soldier's view of the war. While the narrative is engaging, the photos are terrific. The author is not judgmental, and I was moved by how eloquently he was able to recall events nearly 50 years ago. His description of a young man at war is timeless. I gather his R&R in Bangkok worked out OK, somewhat akin to turkey with all the trimmings. The war in Vietnam told from a true soldier's point of view. An excellent read. I have always been fascinated by the Vietnam War from a historical point of view. Author Glyn Haynie tells his tale in a compelling way that brings the experience of the common infantry soldier into focus. From arriving in the country to guard duty, combat missions, dealing with incompetent leadership and a war being run by politicians, losing friends - brothers-in-arms - for no clearly definable reason, and finally returning home, this story relays the human element, the fear, courage, resentment, and anger that are the result of living through such events at such a young age. I highly recommend this book! Plot: The author has built a coherent and detailed narrative of the Vietnam War that is easy to follow even for readers unfamiliar with military history. The story has a definite arc and skillfully conveys the author's experience. Prose: The author's writing style is workmanlike but clear. Although some of the stories are less interesting than others, the short sections provide an appropriately episodic feel. The inclusion of letters effectively varies the narrative voice. Character Development: The author does a good job bringing the soldiers and civilians he encounters to life. He also skillfully illustrates the ways he changes as a result of his experiences. Letters, obituaries, and a selection of photos help bring the cast of characters to life. 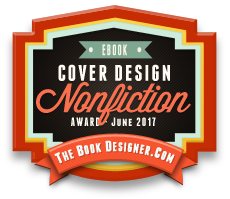 When I Turned Nineteen: A Vietnam War Memoir was submitted to The Book Designer for the e-Book Cover Design Awards, June 2017 for the category Nonfiction and announced the winner for the month of June 2017. The cover was Designed by 1106 Design.